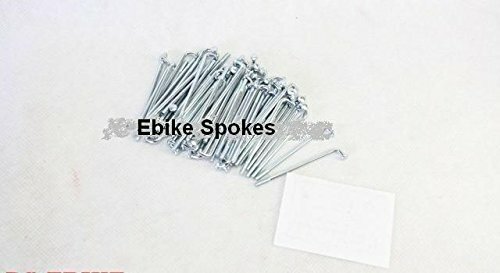 Product Description Spokes for ebike or bicycle After you buy, please kindly tell us which length you want, this is very important. 1. Material: Steel 45# 2. Spoke Diameter: 12G (2.6mm) 3. Spokes Length: 32mm, 56mm, 58mm, 60mm 4. Color: Silver 5. Surface Treatment: Galvanized 6. Every set include 40 pcs spokes 7. If you need other length, please kindly enquire. If you have any questions about this product by HalloMotor, contact us by completing and submitting the form below. If you are looking for a specif part number, please include it with your message.